One of my favorite traditions with my mother is to go book shopping with her. This tradition started at a very early age. When my mother discovered that the “allowance” system she had concocted did not motivate me to make my bed, help clean the bathroom, or do the dishes, she settled for the next best thing. If I practiced the piano and my voice for a certain amount of time each week, she would reward me with a trip to the bookstore and would buy me two books. I guess she figured if she couldn’t make me into a clean, polished person, I might as well develop into a talented musician and a well-read bookworm to compensate for these inadequacies in my personal character. Needless to say, my library grew exponentially in the next few years, I developed a habit of reading constantly, and my music developed into an integral and enjoyable part of life – as I never felt forced into practice. When my mother came to Berlin, I knew exactly where to take her: Dussmann. This four-plus floor mega-bookstore even includes a two-floor English language bookstore with a large assortment of titles. After we slowly sifted through the books separately, we sat together and read the backs of the books together – discussing which ones that we wanted to read. My mother eventually decided upon a fiction title that had been recommended to her by a friend. 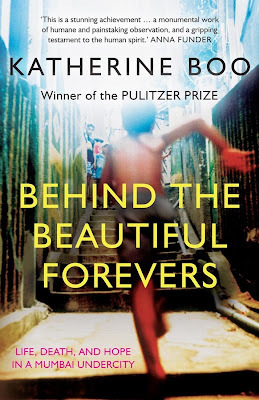 After reading so many books about policy, I wanted a lighter read, which led me to pick up the 2012 Winner of the National Book Award for Nonfiction, Behind the Beautiful Forevers: Life, Death, and Hope in a Mumbai Undercity, by Katherine Boo, a staff writer at the New Yorker. I never intended to buy and read this book as a part of my Global Book Challenge. (Indeed, the first book I ever read as a part of this challenge was about India – In Spite of the Gods: The Rise of Modern India by Edward Luce.) However, I found this book so poignant and gripping that I wanted to write about it and share it on my blog. Ever since I read the anthropology book, Ghetto at the Center of the World: Chungking Mansions, Hong Kong by Gordon Mathews, I have found myself fascinated by the concept of low-end globalization – in particular how this low-end globalization stems from high-end globalization, something which I definitely play a role in. Over the past few years, I have joined the ranks as someone who is involved in high-end globalization: I consider international airports are just a means to get from Point A to Point B – a necessary means rather than a novelty or a reason to get excited. I have a global plan for my cell phone, so that I can contact my friends and family not only in cases of emergency, but also to conduct everyday business. As a multi-lingual and well-traveled person, I expect to eventually add myself to the workplace that perpetuates this high-end globalization. But yet, this globalization affects many others in less positive ways. Such is the case with the main characters of this book – among the three thousand people who live in the slums of Annawadi, which is located right next to the Chhatrapati Shivaji International Airport. The airport, in fact, plays an important role throughout the book. As many of the main characters sort through garbage as their main source of income in order to find recyclable materials, they are constantly hoping for access to the valuable trash that travelers leave at the airport (or throw out of their cars on the way to the airport.) One lucky character is given the opportunity to work in a menial position at one of the hotels surrounding the airport – to the jealousy of many of his neighbors. 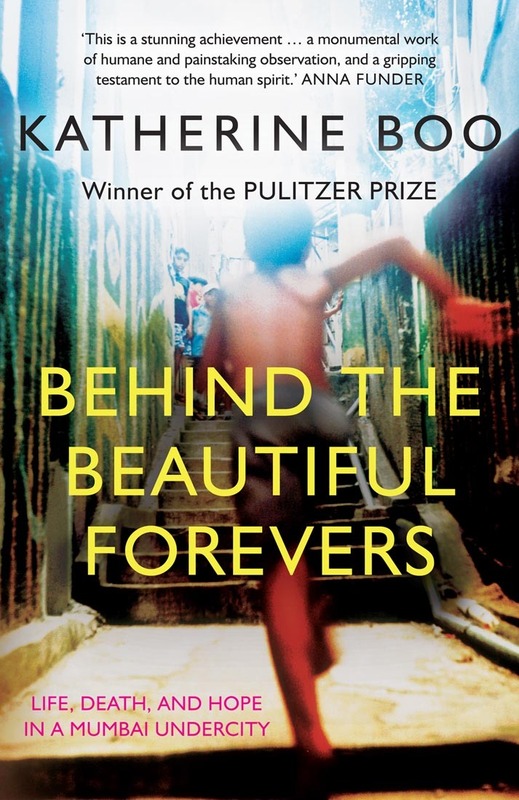 Although this book is non-fiction, it reads like fiction as it follows different people – children and adults alike – as they try to survive and better themselves, often at the expense of their neighbors. Their stories are compelling and I found myself unable to put down the book when reading about the people who were experiencing starvation, lack of medical care, beatings by police, inter-ethnic conflict, corruption, scamming, and voter disenfranchisement. I kept on waiting for the “American dream story” – for one of the characters to rise up and overcome his or her circumstances. However, this story never came. The book ends without any significant change in any of the characters’ situations or positive change brought about through economic development or new policy implementation. Something that really stuck with me was this quote about corruption: “In the West, and among some in the Indian elite, this word, corruption, had purely negative connotations; it was seen as blocking India’s modern, global ambitions. But for the poor of a country where corruption thieved a great deal of opportunity, corruption was one of the genuine opportunities that remained.” (page 28) As I read firsthand about the women who engaged in scamming and corruption directly in order to better the position of their families, I couldn’t help but wonder that if the situations were turned, would I find myself engaging in this behavior? And in an even broader sense, how do you discourage corruption among those who perceive the opportunities offered through corruption as the only option? The books shows instances of what “The West” would consider unethical or corrupt – even among economic development institutions and orphanages. Even more, this book made me question my role in the globalized world and made me ponder how others are affected – even by my subconscious actions - everyday. As the slum essentially was based off of the trash and subsequently, the tourism to India through the International Airport, the slums were very much affected by the global crisis: “A kilo of empty water bottles once worth twenty-five rupees was now worth ten, and a kilo of newspaper once worth five rupees was now worth two: This was how the global crisis was understood.” (page 190) I would recommend this book to anyone – especially the world traveler – in order to help broaden one’s perspective and understanding of what it truly means to be a part of the modern, globalized world.